Description: Train 555 rolls through Belt Line Jct behind a trio of SDs with 63 cars. Description: A second view of 555 rolling north on the Reading Line at Belt Line Jct, this view showing the Reading signal there. Description: Sitting north of Corduroy Road in the morning sun. Description: NS #3258 (Ex-Southern #3258F) at NS Elkhart Yard. Description: You don't see something like this on the BNSF much anymore! Description: NS 171 had a GP60/SD40-2 combo into Oakwood Yard, and is heading to the engine house. NS will put different power on 171 before it heads west towards the UP connection at Salem, Illinois. 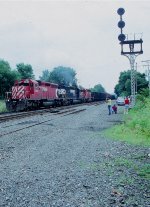 Title: NS 3258 leads 9853 and a long string of empties. Description: An old Southern warrior. Description: Used to be a high hood.